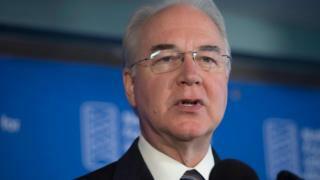 US Health Secretary Tom Price has apologised over his private plane trips on official government business. The former Georgia congressman said he will reimburse taxpayers and fly commercial in future. His apology comes a day after US President Donald Trump said he was "not happy" with Mr Price's trips. Government officials, except those dealing with national security matters, are required to take commercial flights for work-related travel. An investigation by Politico found Mr Price had taken at least 24 such flights since early May at a cost to taxpayers of $300,000 (£223,000). "To make sure everyone knows that this will never happen again, I am taking the following steps," said Mr Price in a statement on Thursday. He said he would continue to co-operate with a review into the matter by his Department of Health and Human Services' (HHS) inspector general. "I will take no more private charter flights as Secretary of HHS," he added. "No exceptions. "Today, I will write a personal check to the US Treasury for the expenses of my travel on private charter planes. The taxpayers won't pay a dime for my seat on those planes." When asked if he would fire the Health and Human Services Secretary over his trips, Mr Trump said on Wednesday: "We'll see." Mr Price's flights have included flying from Washington DC to Nashville for the afternoon, where he spent less than 90 minutes at two scheduled events and had lunch with his son, who lives in the Tennessee city. The Learjet round-trip cost nearly $18,000 of taxpayers' money, according to Politico. The House Committee on Oversight and Government Reform released a letter on Wednesday asking Mr Price about his use of "government-owned aircraft for personal travel or private non-commercial aircraft for official travel". The committee gave Mr Price two weeks to hand over the records. Tesia D Williams, a spokeswoman for the HHS inspector general, told the BBC the agency is reviewing whether it was "potentially inappropriate travel".